An enthusiastic young copper decided to take his drug search a little too far. In the old days, Mick would have slipped him a financial sweetener – no fun having your door kicked in at 3am. He’d been off the stuff for months, but being an ageing Rock musician made Mick an easy target. He would call his lawyer, if only he had the cash to pay him. 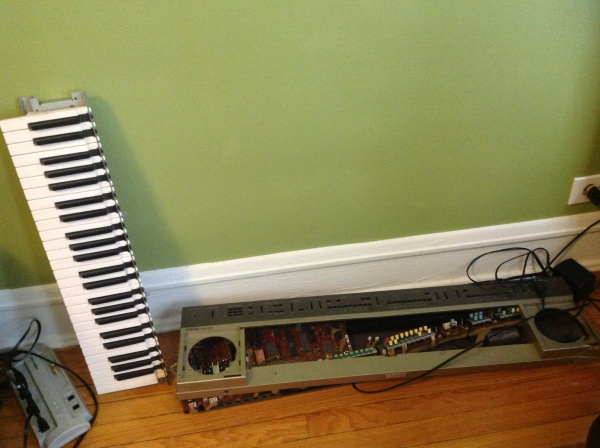 Mick can’t look at the photo of his shattered keyboard without shedding a tear. He still keeps it close, just in case he’s ever tempted to go back on the white powder again. This my contribution to Friday Fictioneers 100 Word Challenge, hosted by Rochelle Wisoff-Fields. Please click the link for more details. View other entries by clicking here. Mr. Jagger’s lawyers will be contacting you. Great story and a good lesson for all. Thanks for your regular comments,Doug. Much appreciated. If Mr Jagger’s lawyers are reading this, the characters are all fictional and the possible resemblance to any person is purely coincidental! Seems that drug search (no s) or search for drugs might read better. Keeping the keyboard as a reminder is a good thing. Thanks, Rochelle. I’ve amended it. I can’t believe Mick’s fallen on such hard times… nice take on the prompt. I agree, when did it all go wrong for Mick Sidebottom? Thanks. He seems determined to stay clean this time. Poor old rocker. A lot of them end up being poor old rockers. So sad. It always surprises me when some Pop or Rock star is declared bankrupt. I guess the money can dry up pretty quickly. I’ve always wondered how many doors could actually be kicked in. Not as many as are on TV, I’m pretty sure. 🙂 Hope Mick can stay clean. They seem to use a metal battering ram these days (health and safety, maybe). I think Mick will stay clean now. Stay away from it! Poor Mick. And it won’t be the last time. Cops, eh? I’ve got sympathy for the poor devil! Almost sounds like you’ve been there. When I saw the photo, I immediately thought of “Search and Seizure”. A musicians life is never easy, and the white powder continues to be offered as a perk. Thanks for the comment. The idea was just a response to the picture. I wondered how he keyboard could have got smashed up. Whatever it takes, I say. A nice take on the prompt, Steve, and you told it well. Also, I love the graphic artwork below. Is that your wife’s blog? I’ll have to go over and visit. Yes, Amanda is my very talented wife! Her site is well worth a look.